At the beginning of 2017, Max Polyakov’s Noosphere became the global technical partner of the World Air Sports Federation (FAI), and by now their fruitful cooperation has lasted for a year. During this time, a number of goals has already been achieved and many more are set for the future for both sides. How did Noosphere & FAI cooperation emerge? 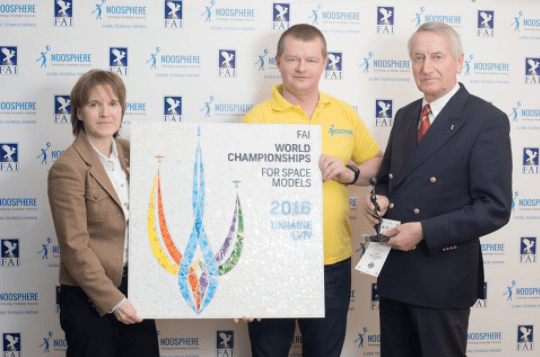 Despite the relatively recent signing of the official agreement, Noosphere and the FAI have worked closely together sing 2015, when Max Polyakov initiated the FAI European Championship for Space Models for the first time in Ukraine. Max Polyakov has always had a great interest in the space industry. The best proof of his interest has been the work he has done with Firefly and Earth Observing System, as well as with Space Systems Engineering. What is more, he is eager to develop the technological environment and the noosphere (the sphere of human thought) in Ukraine. That is why he founded Association Noosphere, which manages a number of social initiatives and works closely with various technical companies, organizations and research institutions. The FAI, in its turn, has been engaged in developing aviation and astronautic activities for more than a century, as well as organizing and coordinating international competitions in aerial sports. Being a non-governmental and non-profit organization, the Federation unites more than a hundred member countries and creates a strong network of adepts in air sports. The world of air sports proved to be an excellent platform for Noosphere to demonstrate its technological expertise. According to Max Polyakov, sports, like business management, have always been a way to challenge people’s capabilities, especially in boundless space. In addition, he is a dreamer by nature. This resulted in choosing a young man dreaming of conquering space as a model of Max Polyakov’s Noosphere logo. All things considered, Max Polyakov & Noosphere decided to hold the FAI European Championships for Space Models, outshining other countries applicants and turning Ukraine into a first-time host. While offline competitions are gradually losing their former popularity, giving way to e-sports, Max Polyakov used the experience of Noosphere stalwarts in this area to attract more attention to air sports. Having gathered 111 participants from 12 countries and about 30,000 unique viewers online and offline, Association managed not only to surprise seasoned participants of the championship but also to set a new benchmark for such events. The event bolstered the relationship between Noosphere and FAI, which led to signing a formal partnership agreement between these organizations. 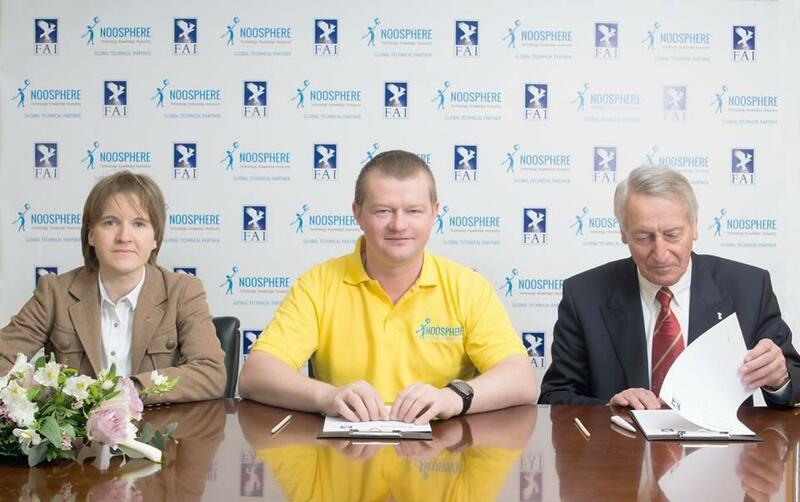 February 2th, 2017 marked this partnership agreement, signed by co-founder of Noosphere, Max Polyakov, and FAI President Fritz Brink with Secretary General Susanne Schödel. Max Polyakov mentioned that this cooperation would bring the cutting-edge technology into the area of technical sports. The first steps would be aimed at providing an innovative measuring system for air sports. It is undeniable that teamwork makes the greatest products. Max Polyakov said that Wikipedia, Airbnb, Uber were so successful due to the joint efforts and this model changed the economy. Inspired by these cases, Noosphere embarked on making special events with the FAI to attract the attention of scientists, engineers and entrepreneurs all around the globe. As the partnership agreement was signed, Noosphere through the support of Max Polyakov, started updating Cup Navigator. The work included developing a pioneering conquest performance reporting system that would support all FAI air sports. This system had to optimize the sport results tracking, improving the precision of the scoring, and easing competition management. 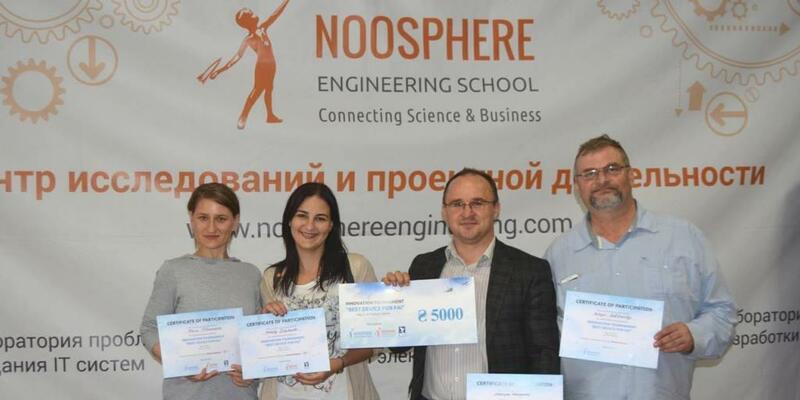 Along with creating an innovative online event management system for IWGA World Games, Noosphere had to hold a hackathon for engineers and students, providing them with an opportunity to work with the world-famous federation and its technical assignments. Furthermore, the FAI was given access to Noosphere’s management system for volunteering. This system was tried out at Noosphere events and various social initiatives of Noosphere in Ukraine. Max Polyakov’s Noosphere is excited to share its solutions and technical base with an organization with 112 years of history overcoming gravity. And Association strives to make the events more well organized and transparent for the participants. Working together and implementing their best practices in cooperation, Noosphere and FAI are taking the air sports up a notch. As mentioned before, one of the points of the cooperation was aimed at creating technical solutions to modernize sports competitions. The matter is that the FAI has existed for more than one hundred years already. At one of the press conferences, Frits Brink, FAI President, expressed the opinion that it is important to involve more young people in the process of developing high tech software and hardware air sports solutions. The rules and traditions that have developed over the past century in the FAI need to be combined with new techniques. It is a part of the organization’s strategy for advancement. Ukrainian enthusiasts took the chance to become trends setters in one of the most exciting sports fields. Max Polyakov did his best to make it happen by supporting social initiatives through the partnership between Noosphere and the FAI. So, the first event after signing the partnership agreement was arranging the “Best Device for FAI” innovation tournament among Ukrainian teams in the field of air balloon sports competitions. Six teams competed to be honored as the winners. There were participants from different universities in Mykolaiv, Kyiv, Zaporizhzhia, Rivne, and Dnipro. The Noosphere Engineering School team powered by Max Polyakov consisted mostly of Oles Honchar Dnipro National University representatives. The competition conditions fit one of the tasks of the air balloon competitions that needed to be automated. The matter was that during flights, the crew have to drop a marker as close as possible to a target. The new service the participants worked on had to measure the distance between that marker and the target as soon as possible and show the results on the judges’ and visitors’ scoreboards. The NES team showed the best result and won the competition. Max Polyakov’s Noosphere Engineering School continued the innovation development journey by implementing the idea into a working prototype. Develop software that connects all the measurement systems, markers and based on the data, show the scoreboard to the public in real time. The Engineering School team, supported by Max Polyakov, has already made progress. They have created a range for testing and passed through two stages of the task. A device prototype is ready, and now they are working on markers and measurement system and testing a waterproof function. Creating the software is going to be the next challenge. Max Polyakov believes that the team will soon finish the project for the FAI Ballooning Commission (CIA) and The World Air Sports Federation. One of the most exciting sports events of summer 2017, the World Games 2017, was held on July 20-30 in Wroclaw, Poland. The World Games 2017 has become part of history. Many significant records were set in various air sports disciplines. The real highlight of these games was the introduction of the innovative scoring system, eNavigator, developed by Max’s Polyakov Noosphere. The World Games 2017 was the first time eNavigator has been used at a large-scale competition. The tool, called eNavigator, was designed by Noosphere of Max Polyakov to make organizing of any sports competition simple and successful. This multifunctional tool is advantageous for several reasons. Firstly, eNavigator improves the result scoring and competition data management. It allows organizers to process and display the results in air sports disciplines like glider aerobatics, canopy piloting, and paramotoring. For all these disciplines, eNavigator sent the results to Swiss Timing (the global leader in sports timing) in the Olympic data format. Secondly, Max’s Polyakov Noosphere created a website dedicated to the World Games. Thus, eNavigator provides the spectators from all over the world with all the information related to the event, such as results, schedule, athletes biographies and event pictures. So, the tool can collect each competitor’s data and display it both on the airfield big screens and the event website. Finally, eNavigator can be used as a communication platform between officials. At the World Games 2017, eNavigator was successfully live-tested and approved by First Brink, the president of FAI. He said that eNavigator fully changes air sports event management. A few months later, the representatives from Noosphere of Max Polyakov took a chance to introduce eNavigator at the 111th FAI General Conference, which was held on 22-28 October in Lausanne, Switzerland. They pointed out the advantages of eNavigator and explained why this tool was such a perfect technology solution for air sports competitions. Noosphere’s founder, Max Polyakov, mentioned that he appreciated contributing to the innovation revolution in the world of technical sports. In early September 2017, the First FAI International Drone Conference and Expo was held in Lausanne, Switzerland. This event was a part of EPFL Drone Days. Obviously, it could not pass without representatives from Noosphere, the FAI’s global tech partner. To be more precise, Michael Ryabokon, co-founder of Association Noosphere together with Vladimir Vasiliev, CTO of EOS Inc. and Max Polyakov, and During the conference, three main themes were deeply considered: “Drones and their Innovations”, “Upright and Safety of Drones”, and the “Drones and Sport”. The conference was held for three days and included a mix of talks delivered by international speakers from different fields of the drone world, with an added advantage that participants could see some of the latest ideas in action. Over a dozen of new developments in the field of drones were presented at the Expo zone. During his speech, Vladimir Vasiliev from EOS, founded by Max Polyakov, stressed the importance of civilian unmanned aerial vehicles and their assistance in analyzing Earth-sensing data, while Mr. Ryabokon gave a talk on “Drones and Sport” on the second day of the conference. He raised the issue of drone racing, that nowadays is becoming a sports discipline, and shared the case of drone-racing development in Ukraine. Specifically, Max Polyakov’s Noosphere has held 5 drone-racing competitions, Copter Race, since 2015. Then, a stage of the FAI Drone Racing World Cup took place in Dnipro in 2017 as a part of traditional Noosphere Copter Race. 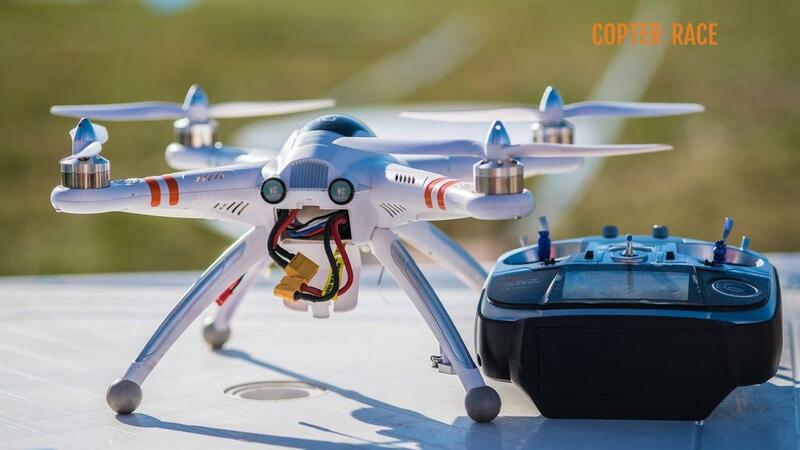 Hosting a stage of the FAI Drone Racing World Cup on September 23-24, 2017 let Copter Race, an annual drone racing-competition powered by Noosphere, reached the international level. More than 40 pilots from Poland, Switzerland, Germany, and Ukraine came to compete in the F3U class in the city of Dnipro, Ukraine. The event took place at the Meteor sports stadium. Max Polyakov mentioned that Dnipro was one of 16 cities who agreed to hold a World Cup event. Oscar Chinello, an Italian FAI representative, came to Ukraine in order to judge the competition along with Dmytro Franchuk, a national judge and Ukrainian champion in the F3C class. The qualifying rounds for the athletes in the stunt competition Freestyle and amateur Fan Copter league happened on Saturday, the first day of the Noosphere Race Cup. The main competition began on Sunday. Needless to say, participants and judges gave credit to eNavigator, an automated scoring system for airport competitions. Later this day, the organizing team from Noosphere of Max Polyakov announced the winners: Andy Hahn from Germany with a 1st place, Swedish pilot Dario Noenschwander with the silver and Victor Dzenzel from Ukraine with a 3rd place. Victor also won a free trip from KAMA KOREA. This has helped him to represent Ukraine at the 2017 FAI Daegu Drone Race World Cup. Max Polyakov explained that drone racing is one of the newest and youngest air sport disciplines. Even the rule set is not complete at the moment. It got certified by the World Air Sports Federation in 2016. Association Noosphere and the FAI has established a partnership in order to turn drone racing into an official sports discipline. From 22nd till 28th of October, the General Conference of the FAI was held in Switzerland for the 111th time. As the supreme body of the FAI, the conference gathers important delegates together with patrons and partners. Co-founder of Association Noosphere Max Polyakov was among them. The aim of the conference was to gather like minded people who make a contribution to air sports activities around the globe and develop a federation strategy for the next year. Max Polyakov and Noosphere, as a technical partner of FAI on the global scale, didn’t miss a chance to take part in the event that shapes the future of the most exciting and hi-tech sports. The FAI conference was held during the whole week and included many events, like Commission President’s Group Meeting, Board Meeting of FAI, discussions, and workshops, the Awards Ceremony, General sessions, and different social activities. In the frame of the Plenary sessions and Workshops, discussions on recent developments in the field of air sports took place. Besides, the conference participants focused on the drone invasion, policies of anti-doping, IT maintenance, and other issues. The Awards Ceremony became the most exciting part of the FAI conference for Noosphere’s co-founder. At the ceremony, FAI President, Frits Brink, nominated Max Polyakov as a Companion of Honour. The body of the conference accepted this initiative due to the contributions that he makes to the FAI on a global scale. This award is not given out lightly. It is presented only in recognition of unusually high contributions to FAI initiatives. As co-founder of Association Noosphere, Max Polyakov admitted that since the start of the cooperation with FAI, it has accomplished a lot. But the best endeavors are still ahead. It is a pleasure and also a great responsibility to be a part of the community as an FAI Companion of Honour. On the whole, nobody would dispute the excellent match between technology offered by Noosphere and the world of air sports. The FAI President, for instance, referred to eNavigator as a highly successful and trusted tool. He appreciated that the system enabled them to achieve greater efficiency in managing competition data and results at The World Games 2017. Mr. Brink is eager to witness vast improvements at FAI competitions in 2018, which stem from continuing cooperation with Max Polyakov’s Noosphere. On balance, Max Polyakov expressed his readiness to take up new challenges and his intention to keep on developing drone sports along with FAI. An upcoming event, 1st FAI World Drone Racing Championship 2018 in China, will be another great occasion to take advantage of the eNavigator opportunities. Max Polyakov and his team are sure they will fulfill and even surpass future expectations.